Chief Minister Shivraj Singh Chouhan said that mandi tax will be reduced from 2.2 percent to 1.5 percent in the state. Vyapar Samman Nidhi will be increased in the state. 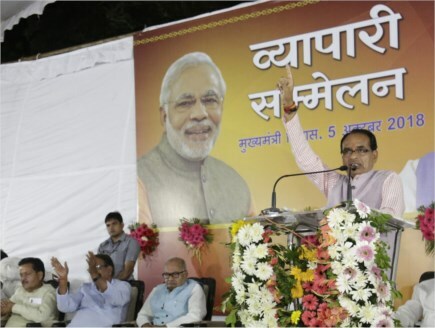 Chief Minister Chouhan was addressing a Vyapari Sammelan in Bhopal on October 5. Chief Minister Chouhan said that 500 young tax consultants will be appointed as GST Mitra in each district in the state. The GST Mitra will help traders in filing GST returns. A plan will be made to compensate loss to traders in case of natural disaster, fire incidences and theft. On the line of global investor's summit, international e-business summit will be organised in the state. A board will be formed to increase the share of traders from Madhya Pradesh in global trade. Portal and app will be developed for e-trading. Vyapar Suraksha Yojana will be framed for traders of the state. He said that employment opportunities will be enhanced if trade is increased. All difficulties in the way of trade will be removed. Small traders will be included in Sambal Yojana.